Werft and entered service in 1996. The 827- x 105-ft. (252- x 32-m) ship is 75,000 gt, and can accommodate up to 2,394 guests in 964 cabins. Emilio Tadini. she was built. The work involved the fitting of panorama balconies to 242 oceanview cabins on decks 9 and 10, as well as to four minisuites on deck 1 1 — in all, 43 percent of the ship's oceanview cabins. This was the first time that refurbishing of this kind had been car- ried out on a cruise ship that was already in service. The installation of the new verandas, which measure about 4.5 sq. m. in the oceanview cabins and roughly 9 sq. m. in the minisuites, also provided the chance to revamp other areas on board the ship. The buffet terrace, located on the stern lido on deck 11. has been extended by 60 sq. m., while two panorama promenades — each about 140 m in length — have also been added to deck 11, one on either side of the ship. Victoria, some 44 percent of the fleet's oceanview cabins are now fitted with verandas overlooking the sea. Costa Atlantica, Costa Mediterranea and Costa Fortuna), this figure is even higher, at 72 percent. More than thirty successful cruise vessels in operation on the world-wide cruise market have a very special thing in common. Their birthplace is in Finland at Kvaerner Masa-Yards' two highly modern shipyards with their state-of-art design capability and production technology. 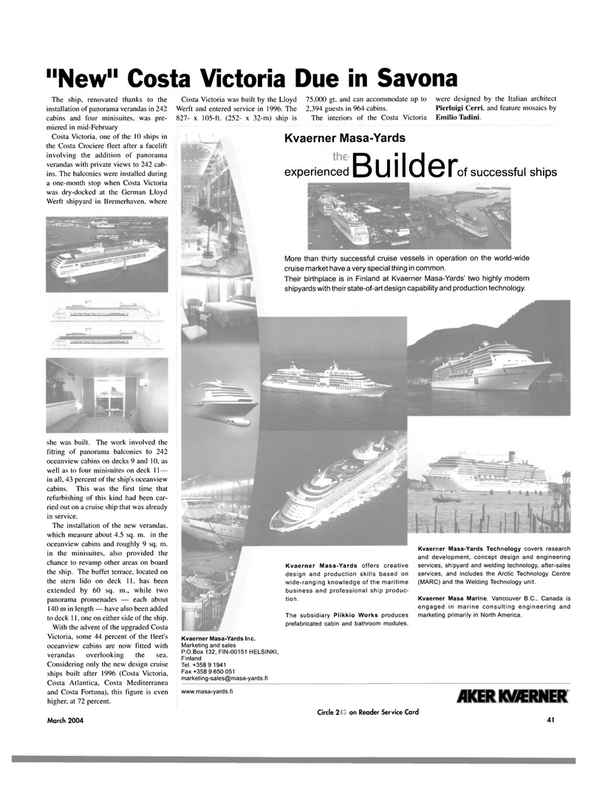 Kvaerner Masa-Yards offers creative design and production skills based on wide-ranging knowledge of the maritime business and professional ship produc- tion. The subsidiary Piikkio Works produces prefabricated cabin and bathroom modules. Kvaerner Masa-Yards Technology covers research and development, concept design and engineering services, shipyard and welding technology, after-sales services, and includes the Arctic Technology Centre (MARC) and the Welding Technology unit. Kvaerner Masa Marine, Vancouver B.C., Canada is engaged in marine consulting engineering and marketing primarily in North America.